Above postcard, circa 1906, kindly sent by Rory Kehoe. 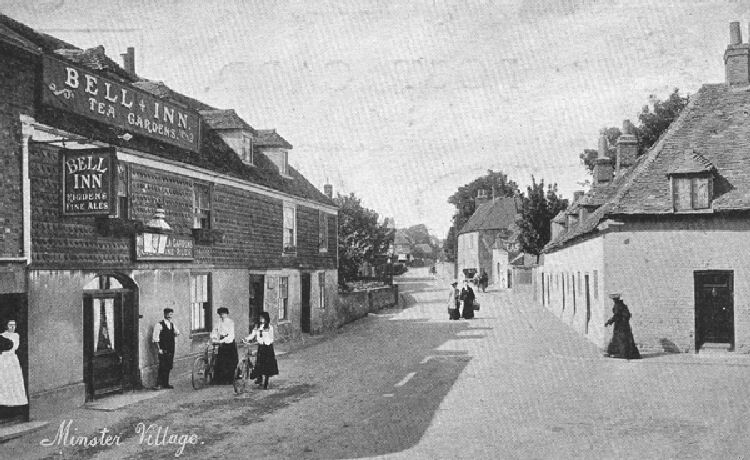 Above two photographs showing the Bell Inn in Minster, date unknown. 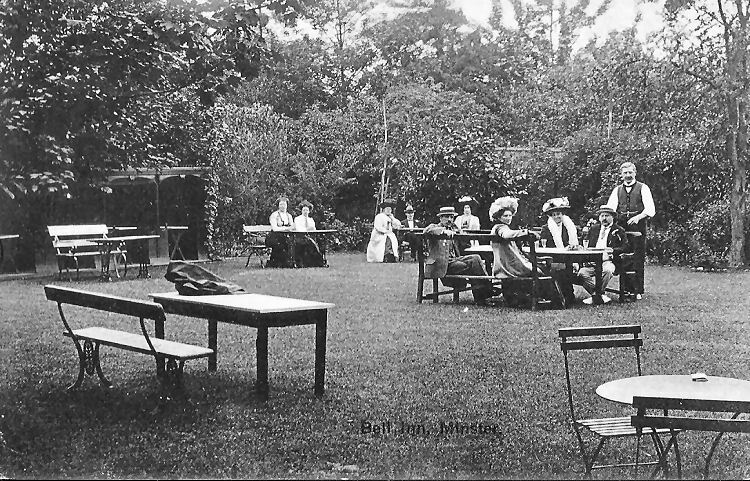 Above postcard circa 1900, showing the garden area. Kindly sent by Rory Kehoe. Above postcard, circa 1919, kindly sent by Rory Kehoe. Above postcard, 1923, kindly sent by Rory Kehoe. 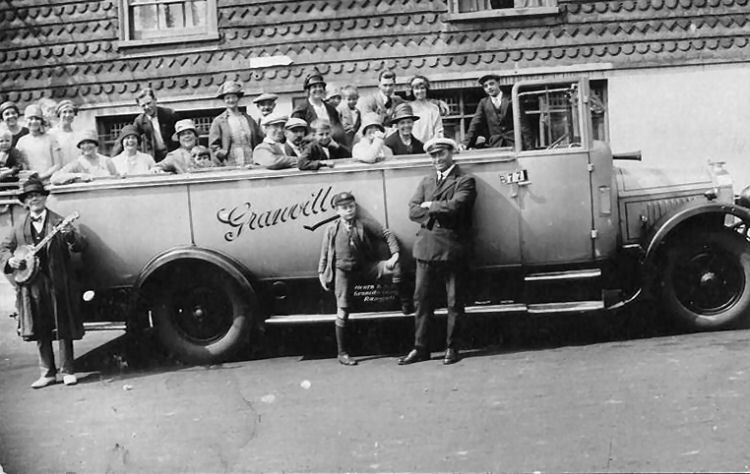 Above photo showing a charabanc run by Benjamin Redbourne and Sons, outside the "Bell Inn," date unknown. 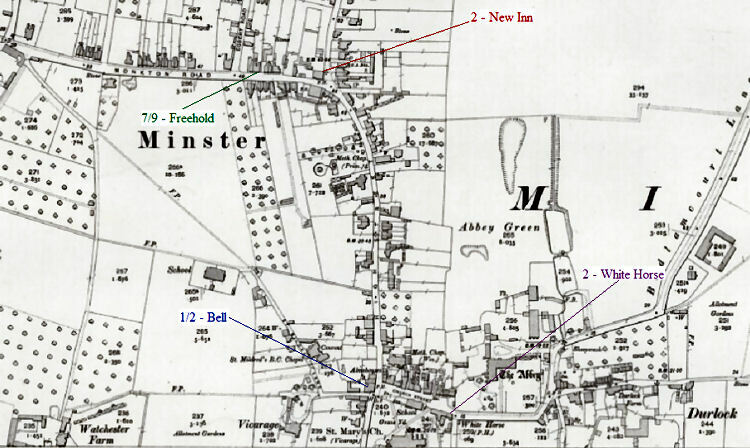 Above map 1905, kindly identified by Rory Kehoe. Above pictures and sign right taken by Paul Skelton, 4 July, 2012. 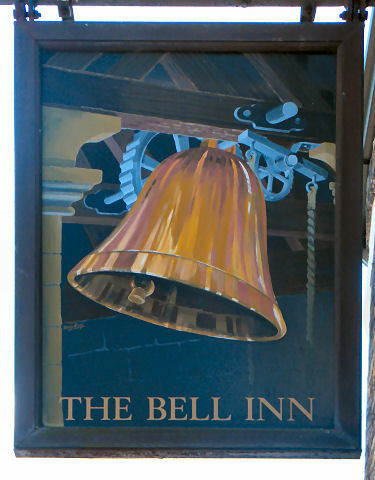 Bell sign right August 1990. 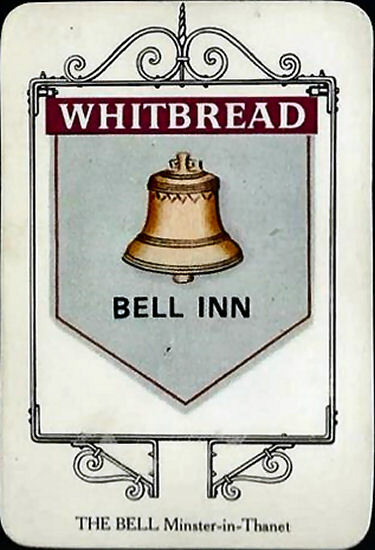 Above card from Whitbread Inn Signs number 7. 1973. A one time outlet for Rigden's beers. In 1934 their telephone number was 15. 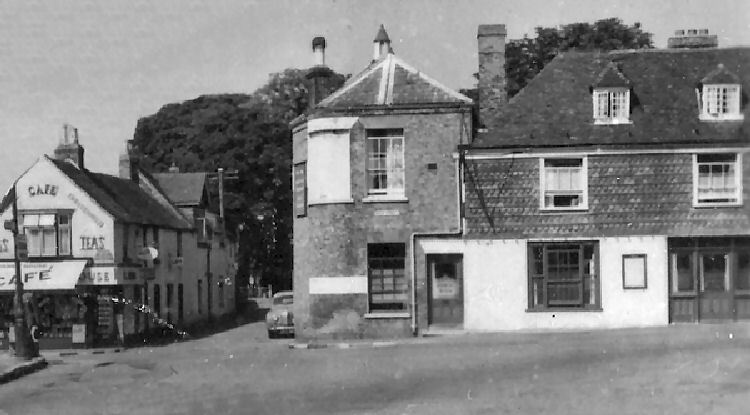 The pub is a long low building of antiquity, and stands opposite the graveyard of St Mary's Church, which is a magnificent structure that has been described as the Cathedral of the Marshes. 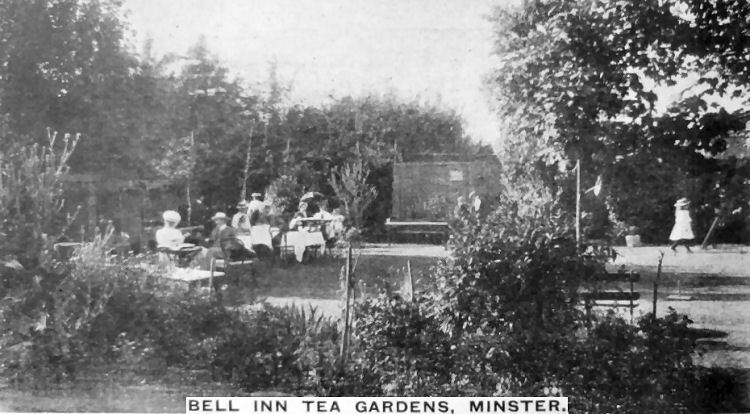 But the inn sign (1985) depicts a swinging bell in a frame, on the green in front of the nearby Minster Abbey, which is again in the hands of Benedictine nuns after a gap of a thousand years. 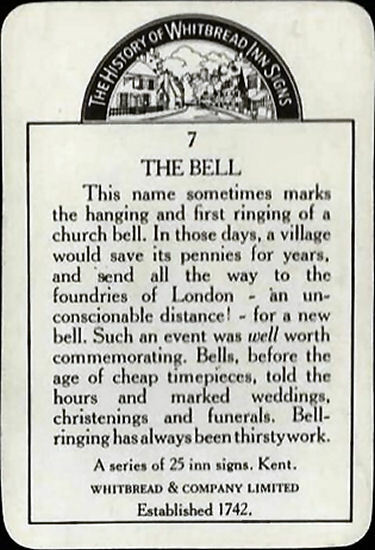 The Bell was a popular venue for horsebrake outings from Ramsgate and Birchington, and there is still a faded advertisement on the pub wall informing visitors about the Tea Gardens'. Canterbury Journal, Kentish Times and Farmers' Gazette, Saturday, 7 October, 1854. 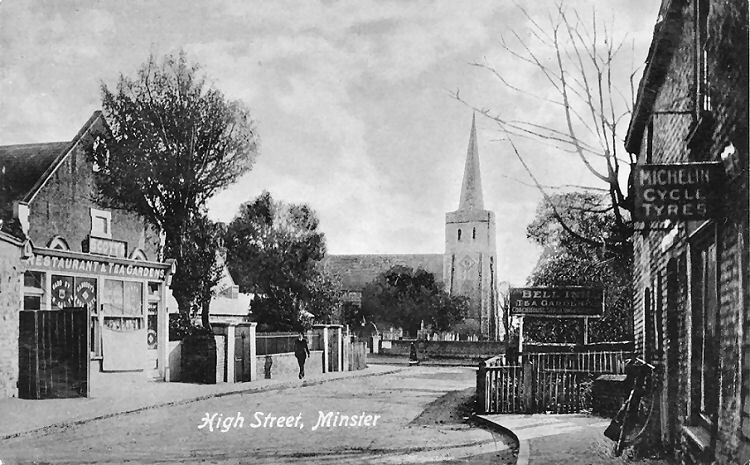 The landlords of the "Bell," Minster, and "Honeysuckle," St. Lawrence, were cautioned by the Bench to be more particular in the management of their houses, and had their licenses granted. South Eastern Gazette 20 January 1857. 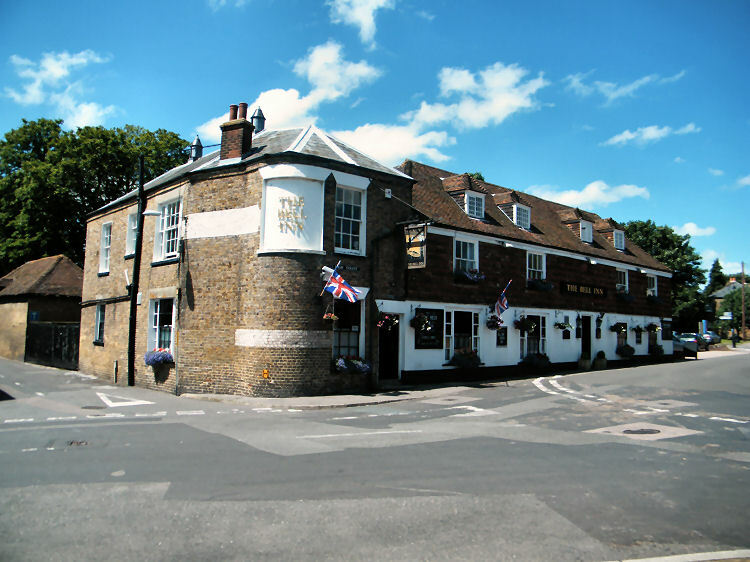 A subscription is open at the "Bell Inn," for the widows and orphans of the crew of the Victory lugger, of Margate, and a daily addition is made to the list in small amounts. Mr. Edward Friend will be glad to receive the smallest amount in postage stamps or otherwise. The larger subscribers are contributing to the committee cards. All who can afford even a penny stamp will, we hope, contribute to such a truly Christian object. From the Whitstable Times and Herne Bay Herald. 5 January 1901. Price 1d. About seven o'clock on Thursday morning Robert Huckster, on going into the back way of the "Bell Inn," Minster, discovered a man lying full length, face downwards, in one corner of the yard. Life was extinct and the man, whose clothing was saturated by the rain, must have been lying dead in the open yard all the previous night. P.C. Butler and Dr. Arnold were fetched to the spot, and the Iattar gave it as his opinion that death probably took place about eight or ten hours previously. The deceased proved to be Charles William Leytor, aged 31, a single man, residing with his parents at 5, Eden Cottages, Minster, who was a painter. 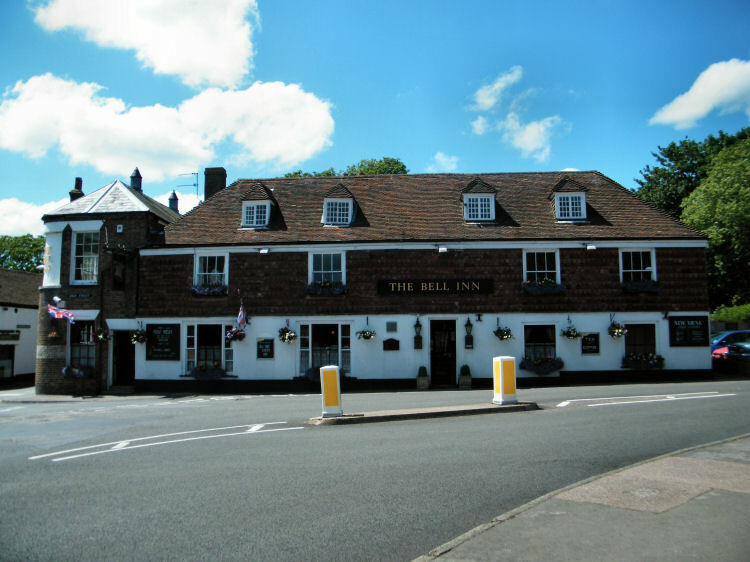 He was last seen alive at the "Bell Inn" about nine o'clock on Boxing night. 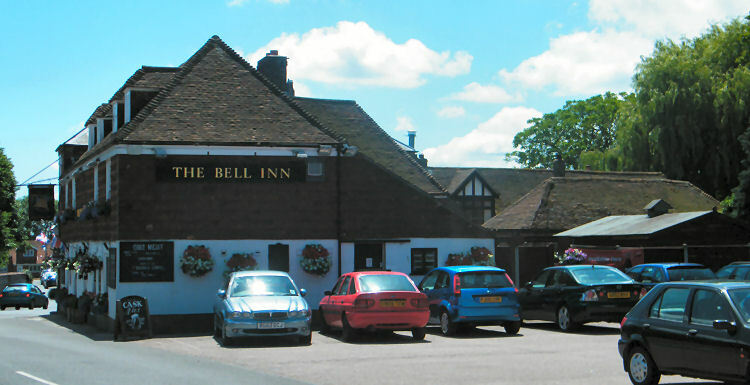 Before going to the "Bell Inn" the deceased met his father and they had some refreshment together. At the "Bell Inn" he was seen by many of his chums who bear out the statement of the landlord that Leyton was perfectly sober, and that when he left the bar he said be was going straight home, and shook hands all round, wishing them “A happy and prosperous New Year.” Two or three of the friends of the deceased left by the front door, but Leyton walked out by the back way, this being a nearer cut home, and from that moment nothing was seen of him until his body was found in the yard. Whether deceased fell and struck his temple then, or whether he went away and returned again is not known, but it is clear that he mast have been lying dead in the yard, which is quite open to the public and well lighted, when the landlord, Mr. Tyler, closed the gates at 10 o'clock. Mr. Tyler saw nothing of the body because he would have no reason to go to the corner of the yard where it was found. There seems nothing to indicate the exact cause of death beyond a slight abrasion on the top of the head, but some light may be thrown on the and affair by the statement that Leyton was, some four or five years since, invalided out of the Navy with heart disease. Layton was a general favourite in the village, and among the members of the Minster Lodge of the Manchester Unity Independent Order of Oddfellows, to which he belonged. Thanet Advertiser, Friday 22 May 1936. 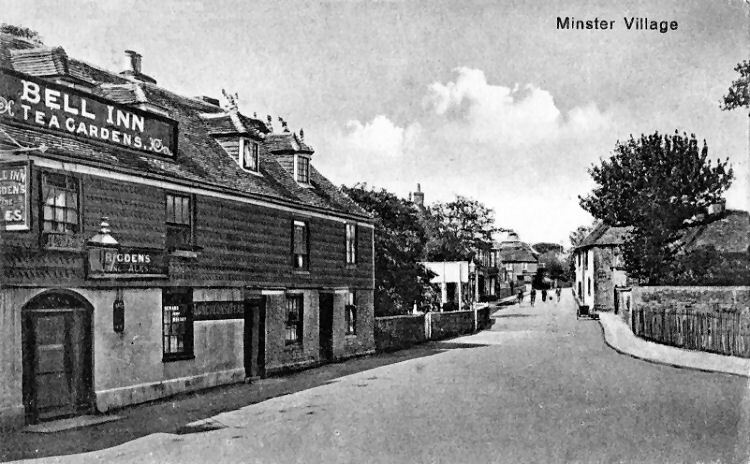 Extensions until 11 p.m. on Whit-Saturday and 11:30 p.m. on Whit-Monday at the "Bell Inn," the "Freehold Inn," the "New Inn" and the "White Horse," Minster, and the "New Inn," Monkton, were granted by Ramsgate County magistrates on Tuesday. 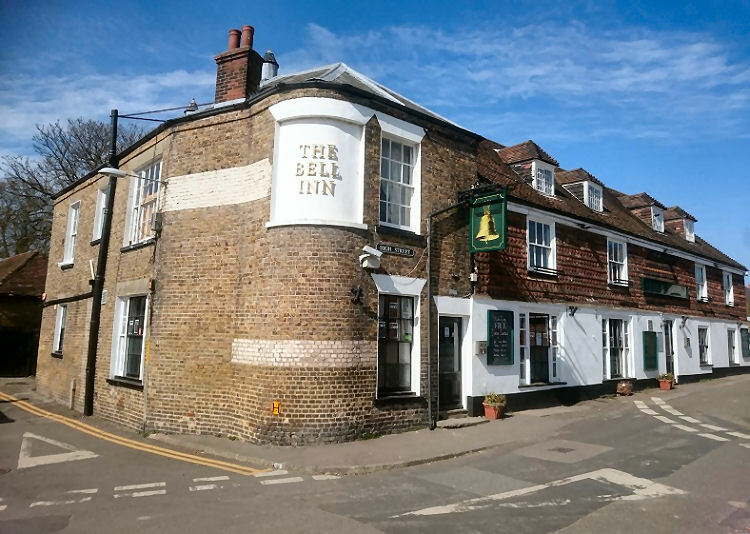 Information sent by John Bates in April 2018 says that the pub is of this time closed.